The Next Movement knows that, without action, community awareness can only achieve so much change. And through their recent community training, “What To Do When A Loved One Is Arrested,” they hope to inspire sustainable change. The training informed South Side community leaders about the rights of people who are arrested and resources available to help them. 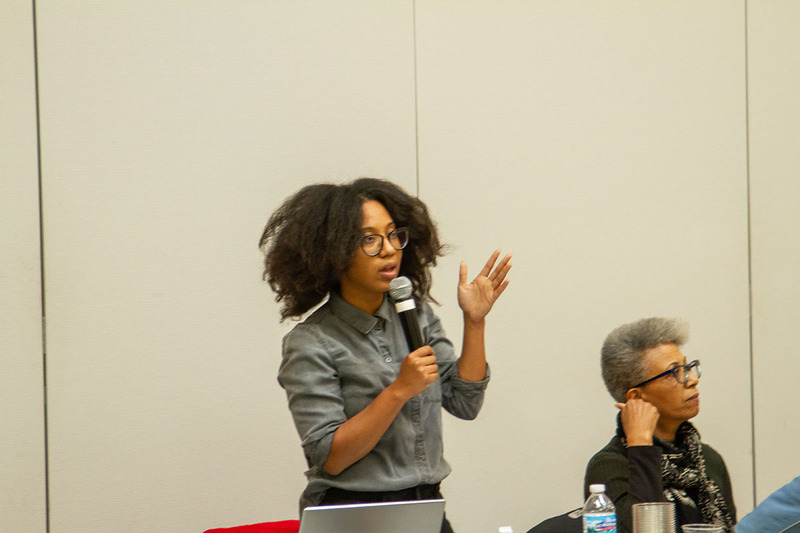 Photo Above: Attorney Angela Lockett gives a presentation about First Defense Legal Aid resources available to people in Chicago police custody during the workshop. 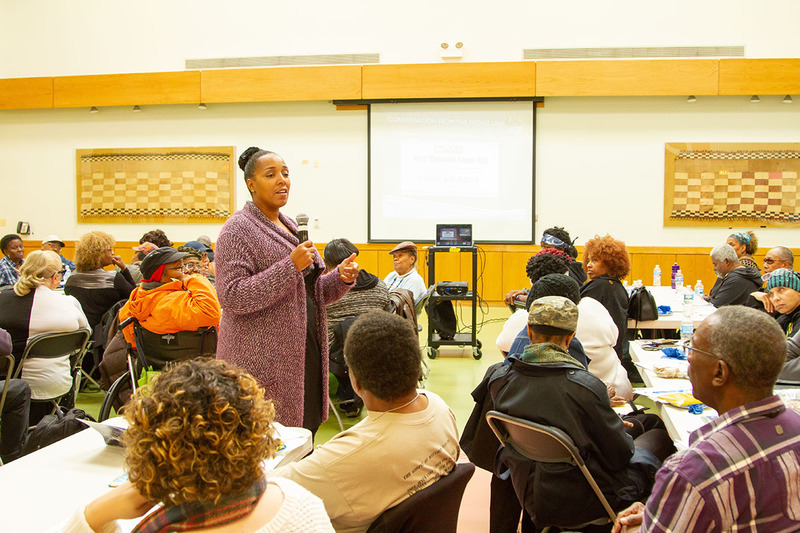 Photo Above: Workshop attendee Jerlene Harris, 72, shares her experience at the training. After a visit by author and civil rights lawyer Michelle Alexander in 2011, the Trinity United Church of Christ prison ministry banned together to create the Next Movement, a committee devoted to abolishing mass incarceration. Since then, their mission has been rooted in educating and equipping South Side communities with the tools necessary to reform the prison system. When planning this year’s (In)Justice For All Film Festival, the Next Movement wanted to ensure programming included a day of action. Parker solidified the idea with a $2,500 Acting Up award from The Chicago Community Trust. The Trust awarded $150,500 to 37 community projects that will support tangible activities benefiting neighborhoods and the public good. These ideas were sparked through the Trust’s fifth annual On the Table, where Chicago-area residents came together on May 8th in mealtime conversations to engage in meaningful dialogue, develop new relationships and inspire action to make a difference in our communities. The “What To Do When A Loved One Is Arrested” training was held on October 13 at the Trinity United Church of Christ, 400 W. 95th Street in Chicago. During the training, 55 attendees heard presentations about legal aid and the rights of people who are arrested from Ruth McBeth, attorney at the Office of the Public Defender of Cook County and Angela Lockett, a criminal and defense attorney and a staff attorney for the First Defense Legal Aid, which provides free, 24-hour legal representation to people in police custody. Photo Above: Next Movement core member Olivia Chase recounts the history of the organization. 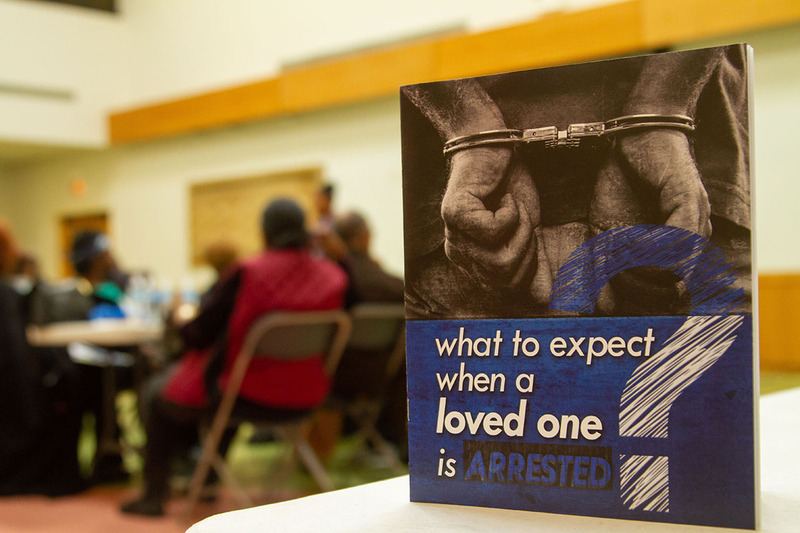 Photo Above: The “What To Do When A Loved One Is Arrested” training booklet, created to educate community members and empower them to lead their own training. “Once we learn how the system works, then we can do our job and make sure that we get some justice in the system,” Lockett said. During her lecture, Lockett noted a few basic tips everyone should be aware of in the event of arrest. Advice included: knowing your right to resist search, in accordance to the Fourth Amendment; invoking your right to refuse questioning during arrest, according to the Fifth Amendment; and ensuring that your first call after an arrest is to some form of legal aid. She also noted that First Defense Legal Aid contact signs are posted in most Chicago police departments. 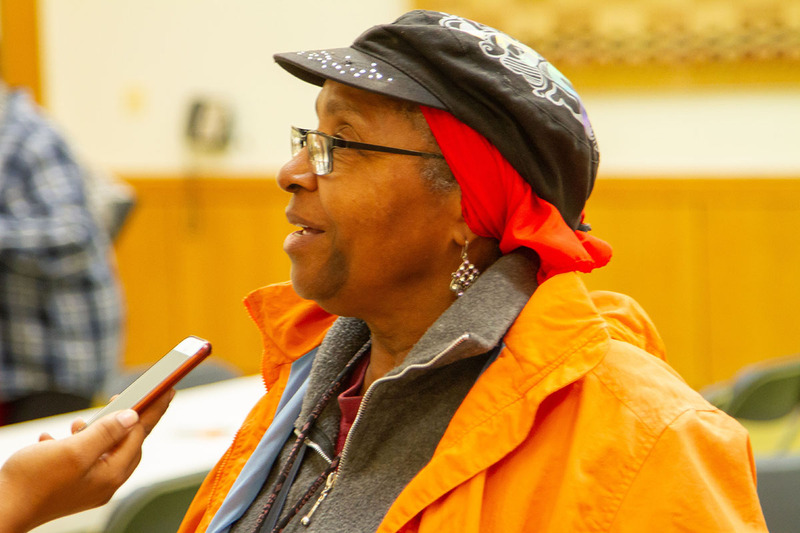 Jerlene Harris, 72, is interested in spreading the word about what she learned at the Next Movement workshop. Parker herself felt the need to further give back to her community after her brother, who struggles with mental illness, was recently incarcerated. 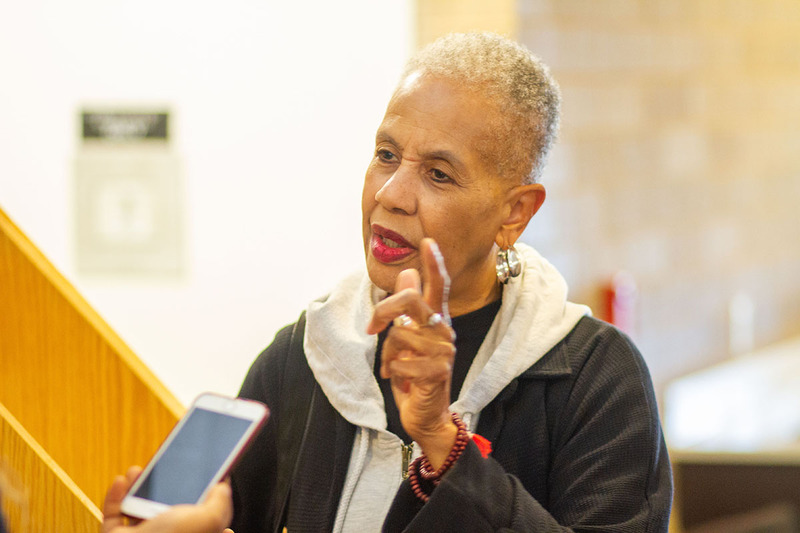 “It was always important to dismantle mass incarceration, but now it’s hit home further that we must dismantle the system, change the way incarcerated people are treated and change how we think of incarceration,” she said. Olivia Chase, a Next Movement member since 2011, has also experienced the effects of mass incarceration first hand through working with incarcerated women, their children and their children’s caregivers. Moving forward, Parker wants this training to go beyond a single day. The Next Movement plans to maintain contact with the community members in attendance and monitor their progress if they chose to conduct their own community training. Photo Above: Acting Up award recipient and Next Movement organizer Njeri Parker, 28, address the audience at the training.